Thanks to all for the nice feedback I've been getting on these Linux experiments. I recently installed another program called Krita (hat tip HMK) and have been playing around with it. 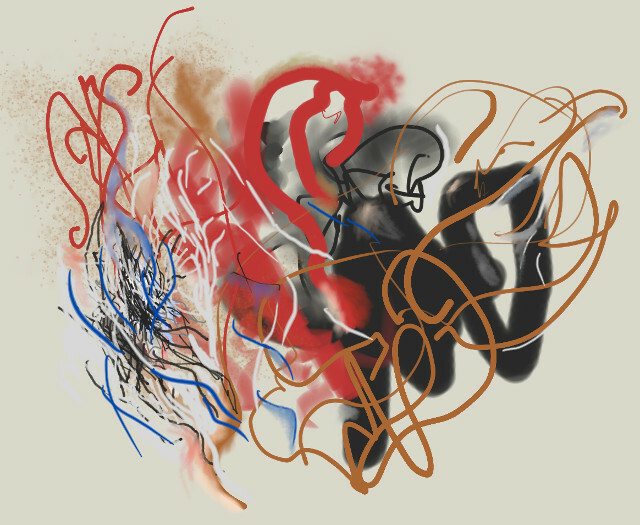 The brushes are a bit more exotic but I'm still working through brush properties and combinations in MyPaint and GIMP. Tonight, a 11 pm (Central), Midnight (Eastern), I'll be doing a guest mix for ffog's show on anonradio. The link for the live stream is at the top of that page (a popout player for VLC works well for me but there are other options). ffog's (aka Joel Cook's) page is here. Wlll be playing tunes I like by other people, including vintage prog, current-ish techno, '60s soundtrack music, and assorted ephemera. If you miss the show, the archive page is here. Studio notes: I printed this out at 16 x 21 inches on 100% rag paper (full bleed, i.e., no border). The hard edges and solid colors of the curving pixel art lines give the printed image a certain "pop," as an object hanging on a wall, owing to the contrast between those sharply defined areas and the softer, photographic parts. It feels complete to me, not needing additional cutting or collaging. Possibly because so many of the texture decisions are worked out on the screen, and the printer is reproducing them faithfully. Conceptually was probably influenced by Reneabythe's photo-comparison Cecily Brown vs Garbage Pix. Yes, there's a bit of "my kid could do that" sneering in those pairings but Cecily Brown kind of deserves it (her earliest work looked like copulating rabbit entrails but I'm not sure what it's supposed to be now -- bee yoo tee ful painting?). The art and technology website Rhizome.org is having a panel this week on "digital painting" (props to andrej and mirrrroring) but two topics they probably won't be discussing are (i) Cecily Brown vs Garbage (could this be the "new abstraction" they are talking about?) and (ii) Artists Who Have Finally Said F.U. to Apple and Windows and Are Switching to Linux. Those would be my salon des refusés topics. 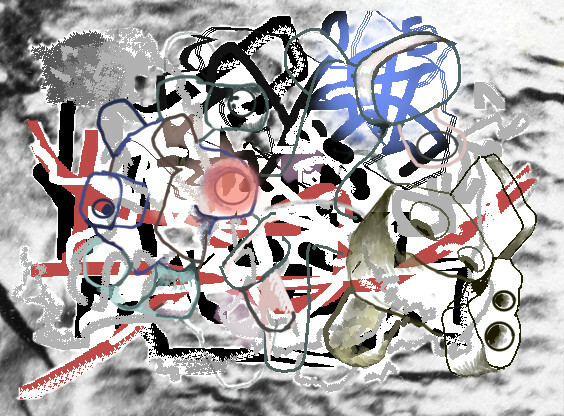 Drawn with Linux MyPaint and GIMP. As noted previously, if you use the "pencil" tool in GIMP it doesn't anti-alias. 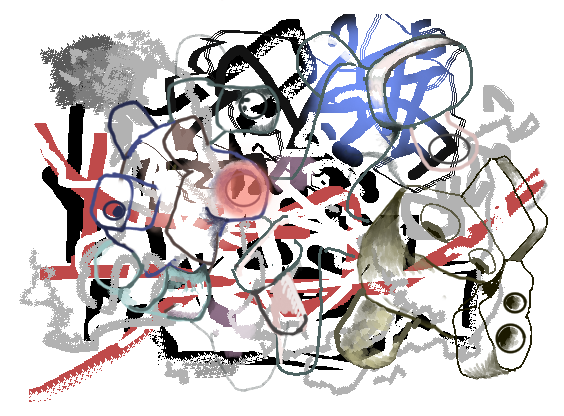 Interestingly you can stay in pencil mode and use some of the other brushes, which behave kind of like pixel art. This pile is a tangle of brush experiments, as well as some things you can do with tinting layers via airbrush (in non-pencil mode). RSS readers were adding a white stripe down the middle of the previous image so it's been remade from an HTML table (ooh specialized knowledge) to a single GIF.